Today is study day at Furman University, so I needed a cake that would inspire studying! 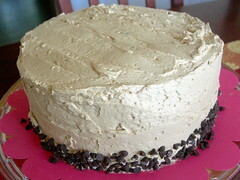 I made a dense fudgy cake with coffee buttercream. Coffee to wake the students up and chocolate to help them remember (we just won't talk about the pending sugar crash). The cake recipe came from Baking: From My Home to Yours by Dorie Greenspan, and the coffee buttercream is a Nick Malgieri one I had on hand from December 2007. It is nearing the end of the semester, and student workers need fuel to finish papers and get through "Oratorio Week" (they are performing Bach's Mass in B Minor on Friday). I've been wanting to make more recipes from Baking: From My Home to Yours, and this was a quick bar cookie recipe. Seriously, this is one of the best books for home bakers out there, buy it. 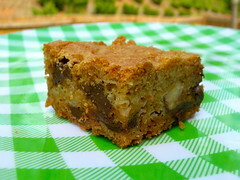 I put chocolate chips, coconut, and hazelnuts in mine, because that's what I had on hand. They would have been even better with some butterscotch or toffee. Wow, I haven't been posting much, because I haven't been baking much! I have been gardening like crazy though, and you can follow that adventure on the Greenhorn Gardeners Blog.